At ViewPoint Cloud, we are challenging the status quo. Quite simply, from our product to our people, ViewPoint Cloud is built around you. ViewPoint Cloud is an engine for powerful workflow automation with native tools for you to design your specific citizen service processes. 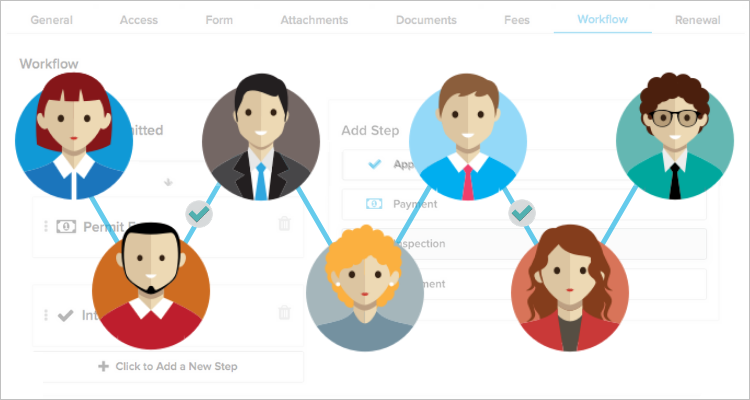 No more getting drowned in paper, missing requirements, delayed approvals, or lost revenue. Many older government software platforms are constructed like puzzles, where users are left with disparate pieces and no clues about how to fit them together. These software companies can make users feel like they can’t do things themselves or don’t allow for users to make edits at all—keeping tech inaccessible and customization hidden behind barriers of programming code and extra fees. It doesn’t need to be that way! ViewPoint Cloud is built with the idea that all governments deserve the same technology and design standards as modern consumer software. That means a digital platform that is intuitive and customizable—think TurboTax for municipal processes. We created an interface that feels familiar and natural to use, regardless of how tech-savvy a user may be (no coding required!). Having the ability to personalize and edit any workflow is at the heart of ViewPoint Cloud. With a simple drag and drop interface, municipalities can customize each unique permit and license workflow to suit their needs. Add payments, approvals, inspections, or documents, and fill in the specifics of each according to your department’s processes. Say you need to add an inspection step to a building permit application, for example. There’s no need to call support, wait for your IT staff, or hire a consultant—it’s as simple as going to the settings menu, clicking into the permit record, and dragging over the “Inspection” step. From here, you can customize the template to your department’s needs. You can auto-assign inspectors, include help text, and specify inspection checklist items. Click “Done” and the edit is complete! While you wouldn’t have to call support to make this change, modern customer management tools mean our Support Team is only a chat or phone call away when you do need help. You build the workflows, and once the structures are put into place, all applications and activity histories are centrally processed through the database. Public submissions automatically populate into the employee end and are dynamically assigned to the workflow for each specific permit type. Applications are routed to relevant staff members in the most efficient order, streamlining the approvals process across departments. In our quest to revolutionize processing and workflow automation, we know that the best source on how government software should work is our customers. So we listen, we iterate, and we innovate. Every new feature and update we make comes from the feedback of our ViewPoint Cloud communities. The software updates go out automatically every month (all you have to do is refresh the browser), meaning the product improves the longer you use it. At ViewPoint Cloud, we design with happiness in mind. We want to make change in government with modern tools to better your day-to-day. We know that no two municipalities are the same, but what they do have in common is the mission to serve their constituents and better their communities.